Despite the promise of needed high-speed service in one of the U.S.’s most progressive state, even long-time pro-rail advocates are stepping away from supporting the current plan. 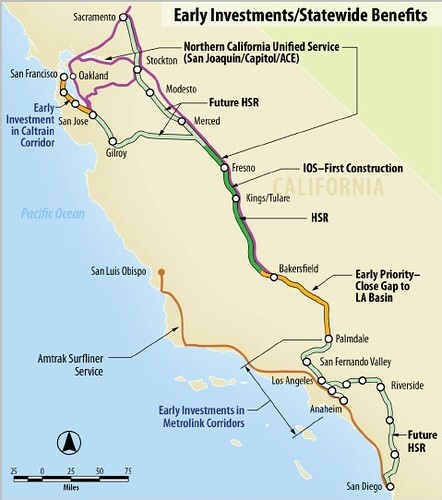 Proposed lines for California’s high-speed rail system. Photo by Richard Masoner. Capping a dramatic showdown over the most expensive project in state history, California legislators Friday gave final approval to high-speed rail, firing the nation’s first bullet train toward the future after an impassioned debate over whether the project’s price tag was too high in a state whose economy is still hobbling. The Democrat-controlled Senate passed the first $8 billion leg of the $69 billion project — fittingly, by a single vote. Following the Assembly’s approval on Thursday, there is little left to stop the state from breaking ground early next year on Gov. Jerry Brown’s plan that voters approved four years ago. “Ten, 20, 30 years from now, Californians will be glad that we made the decision and that they have a 21st century modern transportation system that will be the pride of the country, and the pride of the world,” said Senate President Pro Tem Darrell Steinberg, D-Sacramento. The project required 21 votes to pass — and got just that, with three senators absent. The approval follows months of backdoor negotiations with on-the-fence Democratic senators. In the end, $6 billion was allocated to build the first stretch of high-speed train track in the Central Valley, along with $2 billion to lay the groundwork for service in the Bay Area and Southern California, including the final $705 million needed to electrify Caltrain. California out in front once again,” Brown said in a statement. Some of the most informed members of his party, however, were not convinced. In a dramatic monologue four years in the making, the key oversight senator on high-speed rail, Joe Simitian, D-Palo Alto, silenced the floor by finally announcing he was against the plan. Beach — supported the project. Fran Pavley, D-Santa Monica, was the fourth Democrat who voted no. The group said they support the bullet train in concept but opposed it because of high costs, uncertain funding prospects to complete the line and the plan to spend so much in the Central Valley. Depending on which side you’re on, the bullet train conjures up images of successful endeavors like the Interstate Highway System and Golden Gate Bridge or disasters like the Bridge to Nowhere and Boston’s Big Dig. Supporters say the jobs-creating project is the transportation network of the future, a green way of traveling and the cheapest, most effective way to handle the Golden State’s growing population. But opponents say this is the worst time to start building a project that has doubled in cost since presented to voters, particularly as the state struggles to find the remaining funding needed to complete the entire project. The first 130-mile stretch of track will start springing up in the Central Valley as soon as six months from now, laying the “backbone” for the full 520-mile railroad expected to be built through 2029. Friday’s vote also launches a long-sought project to transform the 150-year-old Caltrain line into an electrified commuter track carrying cheaper, zippier Caltrains between San Francisco and San Jose later this decade. BART will receive $140 million for new train cars, and Muni will receive $60 million for a new subway line to Chinatown. The $1.5 billion Caltrain overhaul, which is also being funded with local and federal funds, is expected to finally solve the popular commuter line’s ongoing fiscal crisis. Caltrain line next decade at the start of a three-hour journey from downtown San Francisco to Los Angeles, with a one-way ticket pegged at $85 in today’s dollars. After stops at stations in Millbrae, San Jose and Gilroy, the train will travel up to 220 mph and possibly stop as far south as Anaheim. “The things that dreams are made of, California does right,” said Sen. Juan Vargas, D-San Diego. But the vote does not guarantee high-speed rail service — far from it. Instead, the state still needs $56 billion to extend the tracks to Southern California and the Bay Area over the next 15 years, and is hoping the federal government and private sector fund the bulk of it. Nearly $20 billion more is needed before the first leg of service can begin between roughly Merced and greater Los Angeles. Without the money, the first stretch of track through Fresno would sit desolate. Most lawmakers who voted against the plan say it was simply too big of a gamble to launch the project now, even though delay would cost the state $3.3 billion in federal grants. The rest of the funding for the first segment will come from $10 billion in voter-approved bond funds. “We cannot afford this. We have crises in every area of the state,” said Ted Gaines, R-Rocklin. Critics say they will continue to fight the first leg of the project. Opponents on the Peninsula and in the Central Valley continue to fight high-speed rail in court while naysayers are collecting signatures in hope of putting the project back on the ballot. Also at issue is Brown’s November tax measure. A Field Poll released this week said about one-fifth of people who were likely to pass the tax would be less likely to vote for Brown’s measure if the state also began building high-speed rail. “This will be the high-speed rail tax,” said Sen. Doug LaMalfa, R-Richvale, whose motion to put the project back on the ballot failed by a 24-12 vote along party lines. Tony Strickland, R-Moorpark, said voters in November will remember Friday’s decision. Yet, despite the gamble, Steinberg said Californians would look back on the decision as a bet on the future. Bay Area News Group staff writer Steve Harmon contributed to this report. Contact Mike Rosenberg at 408-920-5705. Follow him at twitter.com/rosenberg17.